Arabic Handwriting is part of the Safar Learn Arabic Series. The aim of the book is to strengthen children’s familiarity with elementary Arabic penmanship by teaching them to write letters and words. This is the first book in the Safar Learn Arabic Series, wherein students learn to write and study verses of the Qurʾān and Aḥādīth of the Prophet صلى الله عليه وسلم. 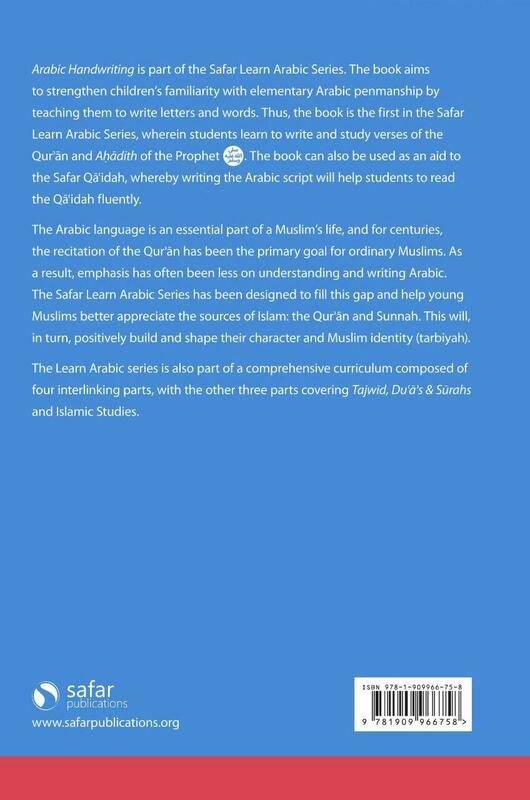 The book can also be used as an aid to the Safar Qāʿidah, whereby writing the Arabic script will aid students to learn and read the Qāʿidah fluently. The Arabic language is an essential part of a Muslim’s life. For centuries, the recitation of the Qurʾān has been the primary goal for Muslims around the world and not much emphasis has been given on understanding and writing Arabic. The Safar Learn Arabic Series has been designed to fill this gap and help young Muslims better appreciate the sources of Islam: the Qurʾān and Sunnah. This will, in turn, positively build and shape their character and Muslim identity (tarbiyah) in sha ‘Allah. Pupils thoroughly enjoy practicing their handwriting. It is also helpful to teach them the arabic alphabet, numbers and words as they go along. Every part of the syllabus is well thought out and at a high educational level. Simply implement point by point and your success is visible.